Publics around the world believe the balance of power between the U.S. and China is tipping in favor of China. While the U.S. is still viewed as the dominant economy by most, people are increasingly likely to say China is the world’s leading economic power, especially in Europe and America. Many global publics also think China will eventually eclipse the U.S. as the world’s leading superpower. People in Africa and Latin America welcome China’s influence. 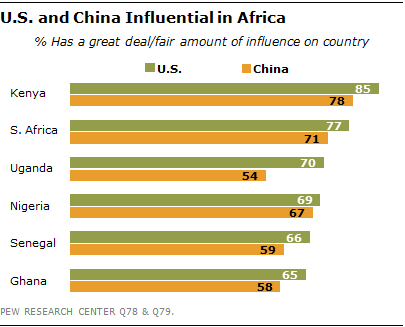 In Africa, majorities say China and the U.S. have a great deal or fair amount of influence on their country and their economy, and they view this impact positively. In Latin America, while the U.S. is still described as the dominant player in the region, many say China’s influence is more beneficial. In Asia, the publics surveyed hold widely different opinions of the two world powers. In 22 of the 39 countries polled, pluralities or majorities say the U.S. is the world’s leading economic power. In eight countries, the publics are more likely to say China. And in the remaining nine, opinion is divided between the two world powers. Attitudes vary considerably by region. In most of the countries surveyed in North America and Europe, China is seen as the strongest economy. Greece is the only country in these two regions where at least half say the U.S. The American public continues to be roughly split over which country is the dominant economic power – 44% say China and 39% name the U.S. In the Middle East, attitudes are generally divided. A majority of Turks and Israelis think the U.S. is the global economic leader, while a plurality of Jordanians say China. In the other countries surveyed in the region, opinion is split between the two. Elsewhere around the world, the consensus is that the U.S. is the leading economy. In Latin America, pluralities or majorities in most countries say the U.S. Venezuela is the only nation surveyed in the region where the public is split – 38% say the U.S. and 32% name China. In Africa, at least half in nearly every country surveyed choose the U.S. as the dominant global economy. Slightly less than half in South Africa (46%) say the U.S., but only 26% name China. Even in the Asia/Pacific region, publics tend to say America is the leading economic power. Broad majorities in Japan, the Philippines and South Korea name the U.S. and a plurality of the Chinese agree (46% U.S. vs. 30% China). Only the Australians are more likely to say their regional neighbor is the world’s strongest economy (28% U.S. vs. 61% China). Belief in China’s economic prowess has increased over the past few years along with China’s growing economy. Among the 20 countries surveyed in both 2008 and 2013, a median of 20% said China was the world’s leading economic power in 2008; that has risen to 34% today. The median percentage naming the U.S. has dropped from 47% to 41%. The change has been particularly large across Europe and in the U.S., as well as in Australia and Lebanon. In these countries, the percentage naming China as the dominant economy increased by roughly 20 percentage points or more over the past five years. Regardless of which country is seen as the economic powerhouse today, many publics believe China will eventually replace the U.S. as the world’s leading superpower, if it has not already done so. In just six of the 39 countries surveyed do pluralities or majorities say China will never replace the U.S.
Europeans again stand out for their belief that China has eclipsed or will eclipse the U.S. as the world’s leading superpower. At least half in most European countries surveyed hold this view. A majority of Canadians also think China has or will become the world’s superpower. Meanwhile, Americans are evenly divided – 47% believe China will replace the U.S. or has already done so, while an equal percentage says China will never do so. In the other four regions surveyed, publics generally believe China will replace the U.S. as the world’s leading superpower, though opinion is somewhat more split. In the Asia/Pacific region, at least half of Australians, Chinese, South Koreans and Pakistanis say China will or has become the dominant global power, while majorities in Japan and the Philippines believe the U.S. will retain its status. Publics in Indonesia and Malaysia are divided. In Latin America, pluralities or more in five of the seven countries surveyed say China will replace, or has already replaced, the U.S. as the world’s leading superpower. Salvadorans are more likely to say the U.S. will continue to be the dominant global power, while the Brazilians are divided. African publics are somewhat less certain of China’s ascendancy. Of the six countries surveyed in the region, pluralities in Kenya, South Africa and Nigeria say China will replace the U.S. or already has. In Uganda, a plurality believes the U.S. will remain the leading superpower. And the publics in Ghana and Senegal are almost evenly split. There is no consensus in the Middle East on this question. Half or more in Egypt and Lebanon say the U.S. will continue to be the world’s superpower. 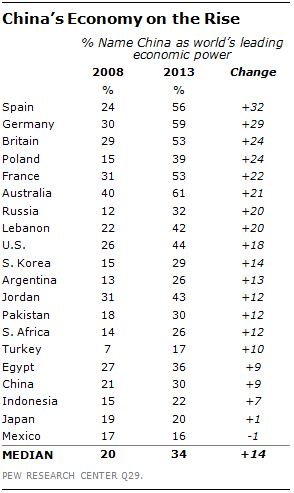 Palestinians and Tunisians, meanwhile, are more likely to say China is on the rise. Turks, Jordanians and Israelis are uncertain as to which country will be the leading power in years to come. As with the topic of economic dominance, more people today than in 2008 say China will replace or already has replaced the U.S. as the world’s superpower. Some of the biggest changes are in Europe, such as in Poland, where the percentage who believe China will become the next superpower jumped 17 percentage points over the past five years. In the United States, 36% in 2008 said China would eclipse the U.S. and 47% say the same today. Double-digit increases have also occurred in Lebanon (+15), South Africa (+14) and Indonesia (+12). Chinese investment in and trade with Latin American countries has increased greatly over the past few years. China is now one of the largest trading partners for the region, in addition to the U.S. and the European Union. Even so, most publics in the region continue to say that the U.S. exerts greater influence than China over their country and their economy. Roughly half or more in each Latin American country surveyed say that the U.S. has a great deal or fair amount of influence on the way things are going in their nation. Fewer say the same about China. The sole exception is Venezuela, where equal percentages think the U.S. and China have an influence in their nation. A similar pattern holds when publics are asked specifically about American and Chinese influence on their country’s economy. In most countries surveyed, at least half think the U.S. has a great deal or fair amount of influence on economic conditions in their nation, including 85% in El Salvador and 84% in Brazil. Fewer think China has a similar level of influence. The one exception again is Venezuela – 47% think the U.S. has an impact on their nation’s economy, while 57% say China does. Although the U.S. is generally seen as having a greater impact than China, China’s influence is viewed more positively in most countries. 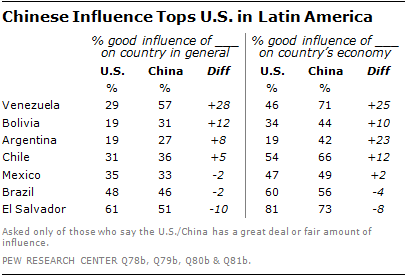 In Venezuela, Argentina, Bolivia and Chile, those who believe the two world powers have a great deal or fair amount of influence are more likely to say that China’s influence is a good thing than to say the same about the U.S.
For example, 27% of Argentines who say China has an impact on their country think this influence is good; just 19% review American influence positively. When it comes to the economy, the gap is even larger – 42% say China has a positive impact on the Argentine economy, compared with 19% for the U.S. Venezuelans are particularly likely to rate China’s influence more positively than America’s. 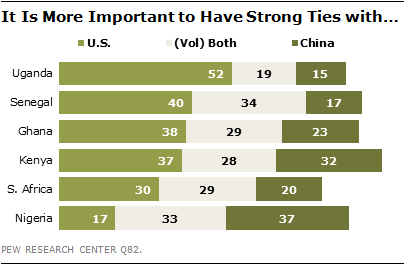 Brazilians and Mexicans hold similar opinions of the role the U.S. and China play in their nation. 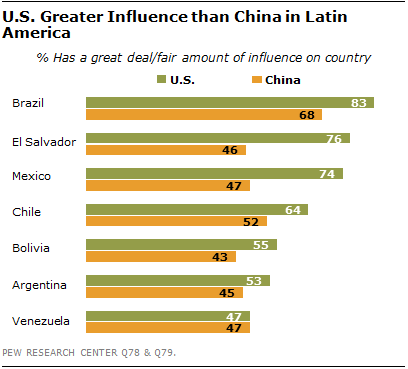 In Brazil, 48% of those who say the U.S. has a great deal or fair amount of influence on their country think this influence is good, and 46% say the same about China. In Mexico, the comparable percentages are 35% for the U.S. and 33% for China. Salvadorans are the only ones who see America’s impact on their country in a much more positive light than China’s. Nonetheless, at least half of those in El Salvador who say China has an impact on their country and their economy think such Chinese influence is good. 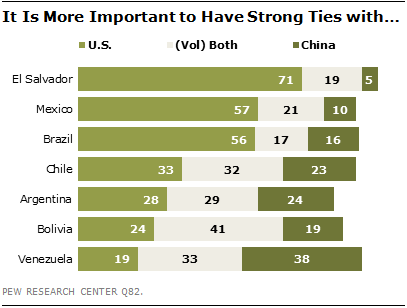 Despite their preference for China’s influence, most publics in Latin America think it is more important either to have strong ties with the U.S. or to maintain a good relationship with both world powers. Few say China is a more important ally than the U.S. Majorities in El Salvador, Mexico and Brazil think a strong relationship with their northern neighbor is more important than close ties with China. Chileans and Argentines are more divided. In Chile, a third think the U.S. is a more important ally while 32% want strong ties with both the U.S. and China. The Argentine public is nearly equally split between choosing the U.S., China or both. Meanwhile, a plurality in Bolivia prioritizes a good relationship with both world powers. Venezuelans lean more toward having a good relationship with China than do other Latin American publics. 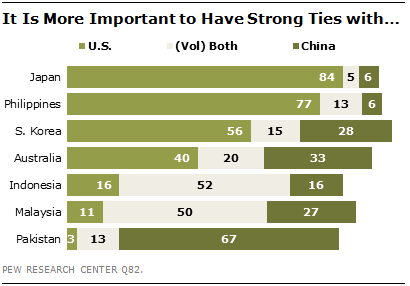 Nearly four-in-ten (38%) say it is more important to have strong ties with China, while a third think both China and the U.S. Just 19% prioritize having the U.S. as an important ally. China has also increased its economic presence in Africa over the past decade, establishing itself as the region’s largest trading partner. African publics appear to recognize China’s efforts – among the six nations surveyed, broad majorities in most countries say China has a great deal or fair amount of influence in their nation. Nonetheless, most of the publics surveyed see the U.S. as somewhat more influential than China. Ugandans are the most likely to see a larger American influence on their country’s direction: 70% say the U.S. has an impact, compared with just 54% for China. When it comes to the economy, however, most publics surveyed in Africa think the U.S. and China have similar levels of influence. For example, 82% of Kenyans say America has a great deal or fair amount of influence on economic conditions in their country; an equal percentage believes the same about China. Roughly equal majorities in the other countries say the same about the two world powers. Ugandans, however, are much more likely to think America (70%) has an impact on their economy than to say China does (55%). 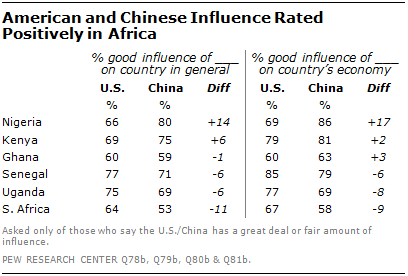 African publics are positive about the influence both the U.S. and China have on their countries and their economies. Among those who say the U.S. has a great deal or fair amount of impact, broad majorities in every country see this influence as positive. Clear majorities in nearly every country say the same about China. 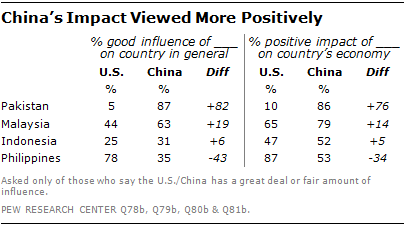 Still, Nigerians are more likely to view China’s impact, rather than America’s, as good. South Africans, meanwhile, are somewhat more likely to rate American influence as positive than to say the same about Chinese influence. Among African publics, there is generally not a clear winner in terms of who they see as a more important ally. Uganda is the only country where at least half say it is more important to establish strong ties with the U.S. than with China. About four-in-ten in Senegal (40%) and Ghana (38%) also prioritize a good relationship with the U.S., but roughly three-in-ten or more in both countries say it is important to establish strong ties with both the U.S. and China. South Africans are divided between establishing strong ties with the U.S. (30%) and prioritizing alliances with both world powers (29%). Kenyans are nearly equally split between choosing the U.S. (37%) and choosing China (32%) as the more important ally. Nigerians are the most likely among the African publics surveyed to see strong ties with China as more important (37%). Nonetheless, a third prioritize an alliance with both countries. Despite their proximity to China, in Southeast and South Asia, publics do not believe China has a greater impact on their countries than the U.S. Filipinos and Pakistanis are more likely to say the U.S. has a great deal or fair amount of influence on the way things are going in their country than to think China does. Indonesians and Malaysians see the level of American and Chinese influence as relatively equal. Asian publics’ perceptions are slightly different when it comes to American and Chinese economic influence. Malaysians are somewhat more likely to say China affects their economy (72%) than to say the U.S. does (63%). Few Pakistanis say either country has an impact on their nation’s economic conditions (41% for China and 44% for U.S.). Nearly equal percentages of Indonesians say the two world powers have an influence on their economy (75% for China and 72% for U.S.). Filipinos, meanwhile, are more likely to believe the U.S. (89%) has a great deal or fair amount of influence on their economy than to say the same about China (69%). 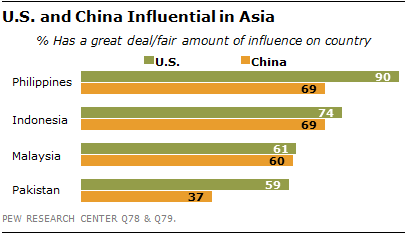 Malaysians and Pakistanis are much more likely to say China’s influence is good than to say the same about the U.S. For example, among those who say the U.S. has a great deal or fair amount of influence on their country, just 5% of Pakistanis say this influence is positive, compared with 87% who rate China’s influence as good. The gap is smaller, though still in China’s favor, in Malaysia. Indonesians rate each world power’s influence relatively equally, while Filipinos are much less positive toward China than toward the U.S. When asked which world power is a more important ally, Pakistanis overwhelmingly choose China (67%). Filipinos are much more likely to choose the U.S. (77%). And at least half in Indonesia and Malaysia prioritize a good relationship with both world powers. Among China’s other regional neighbors, Japanese and South Koreans are much more likely to value strong ties with the U.S. than with China. Australians are somewhat more divided – 40% say it is more important to have the U.S. as an ally, while 33% say the same about China.